The Traditional Representational Art Conference, TRAC2014, is set to be a landmark event. 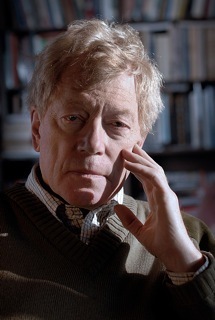 Philosopher Roger Scruton, famous for his BBC series Why Beauty Matters, will be there as a keynote speaker and will participate on a panel with Odd Nerdrum, regarded as the greatest living painter. Neither of these men make very frequent appearances, especially in the states, and this is a rare opportunity to hear them speak their ideas in person. Their discussions will revolve around the subjects of beauty and kitsch, and the philosophy behind today's Representational Renaissance. Juliette Aristides, painter, author and founder of the Classical Atelier at the Gage Academy of Fine Art in Seattle, is actively dedicated to rebuilding a traditional arts education in the United States. She is also a keynote speaker at this years conference, which is being held at the Crown Plaza Hotel in Ventura, C.A. from March 2-5, 2014. An interesting aspect of the conference is that there will be presentations of academic papers by many noted painters, professors and historians on a wide variety of subjects, yet all concerned with representational painting. Painter, Steven DaLuz, Art professor and Huffington Post blogger, John Seed, Editor of Fine Art Connoisseur, Peter Trippi and the Dean of Fine Arts at the University of Southern California, Ruth Weisberg, are just a few of the many speakers one has the opportunity of hearing at TRAC2014. For those of you who may still be unaware, representational painting has seen a rightful resurgence in popularity, among those who practice the craft as well as those who enjoy and collect it. There is a new renaissance going on here, but as Michael Pearce, co-founder of the event has pointed out, Vasari didn't label what we know as the Renaissance with that term until 150 years after it happened. Michael Pearce has connected many people involved with representational art today together using social media, his genuinely friendly personality and his love for representational art. I asked him to explain for us how the idea for the conference came about. MP: Four years ago, Michael Lynn Adams and I were walking through the park at California Lutheran University, where we both work to teach undergraduates how to paint and draw. We spoke about a gathering he had been to at Alexey Steele's studio, where he had met seven of eight prominent realist artists and thoroughly enjoyed talking about painting with them. We remember discussing how important community is to any movement, and how artists who were concerned with traditional techniques didn't get the critical attention they deserved for some of the incredible work they make. We recognized that there was no venue for academics to discuss what was going on, which seems incredibly important for the contemporary representational art movement -- because it will be taken seriously if there is a body of academic writing about it. We decided to try to get funding for a conference and after preparing a concept and a budget we approached Chris Kimball, the President of CLU. Somewhat to our surprise, and very much to our delight, he agreed to fund it. Building the first conference, in October 2012, was nerve-wracking because we were aware that other attempts to do similar events had not been successful, but we were convinced that the academic papers would be the key to making TRAC work. The Representational Art Conference is about helping to build the representational art community and providing academic foundations for its work. BK: Clearly, painters will be interested in the importance of this conference. There will be many demonstrations by some of the best painters around, including Graydon Parrish, Jeremy Lipking and many others. I asked Michael if he has anything to say to collectors, investors and gallery owners with regards to the importance of, and why they should attend, this conference? 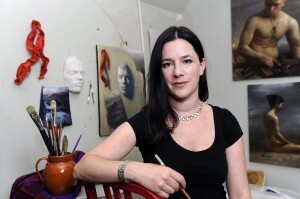 MP: Contemporary representational art is the most exciting, progressive area in the art world. Postmodern ideas have stagnated and are going nowhere. Investing in the representational art movement is smart because it is where works of art that become icons of our time are going to establish themselves. Where better to learn about what is happening in the philosophy and practice of this dynamic movement than at The Representational Art Conference? BK: You have spent much time studying allegory and how the meaning of a symbol or word, can change over time. What is your take on Nerdum's Kitsch philosophy? Does it hold water, as slippery and wet as it may be? MP: Odd's appropriation of the word kitsch divides us because it's so pejorative, and makes us feel bad about being associated with something negative. Many of us aspire to high ideals in the work we make, and kitsch makes us think of cheesy ornaments and bad genre paintings. When I first read Kitsch I happened to find a really awful reproduction of a painting of an old fisherman smoking a pipe at a garage sale. I hated it, because it had absolutely no relationship to what I was trying to do with my allegorical paintings, being firmly rooted in emotional response and empathy. So I bought it and brought it to my studio, hanging it over the loo to remind me that empathic responses are just as powerful as intellect. To some extent this led me to emergence. There's a lot to be said for empathy. Look at the wealth generated by Thomas Kinkade from sales of reproductions of his work, which is tremendously popular because it captures the imagination of huge numbers of people, who long for the landscapes and cottages he painted. They love his work regardless of the intense criticism he felt for his technique. 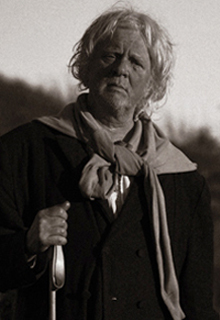 The same focus on empathy drives much of Odd Nerdrum's work (Hepatitis, for example) except he paints so brilliantly that many of us aspire to his technical standards. His combination of technical mastery, allegory and empathy is what makes his paintings so powerful. BK: I have enjoyed your interviews on Art Chat radio. Will you be presenting your personal ideology of emergence at the conference? MP: I wouldn't describe it as a personal ideology, because many people write about emergence and consciousness, although it's true that very few describe the implications they have upon contemporary art or culture. I'm going to offer a paper about emergence, with some thoughts on the implications of new discoveries in neuroscience upon the aesthetics of contemporary representational art. To some extent neuroscience is merging with philosophy -- philosophers have always attempted to understand the mind, but in the past they have been unable to probe into the working of the brain without destroying it. Now, scanning equipment allows us to observe a small fraction of the action of the brain, we are able to understand a little more about how consciousness works. This has profound implications upon aesthetics, which is always founded upon philosophy. I want to understand the philosophical roots beneath the revival of representational art. BK: How do the philosophies of Scruton and Nerdrum differ as you see them? How are they the same? MP: I hesitate to put my words in either man's mouth, but I see them offering very different ideas. Roger is keen to emphasize beauty as a necessity for mankind's spiritual well-being, while Odd's paintings often pull beauty from ugliness and distress. Roger detests the nihilism he finds evident in much contemporary art, while Odd has used postmodern ideas as a platform for traditional technique. Both of them point back to the past as a means to finding hope for the future of skill based art; Roger does it by exploring philosophy and in his desire for reviving the refined aesthetic pleasure in beauty that he finds in eighteenth and nineteenth century Western culture; Odd does it in his technically brilliant emulation of Rembrandt and his ideas about a return to art that is made for creating an emotional response rather than distanced intellectual discernment. BK: Your work at Cal Lutheran to bring representational painting back to the university is, as far as I know, fairly unique among today's art departments. Do you see other universities following suit and adding representational programs to their curriculum? MP: I think that will take time, but there are several good reasons to expect it. As we build the body of academic work that focuses upon new ideas about representational art and skill based technique I think other universities will recognize the value of supporting new programs because they will want to be up to speed with current developments. I am absolutely certain that the success of the ateliers will catch the attention of the big universities who have marketing departments who study trends that impact recruitment, and they will want to exploit the potential of this new generation of students, so administrators will encourage their art departments to introduce new curricular ideas. And I think incoming students will insist increasingly loudly that they get an education in art that has a practical outcome in the job market. Skill-based training in art provides skilled employees for the burgeoning market for careers in computer graphics, design, animation, and not least, the enormous video game industry, which was reportedly worth ninety three billion dollars in 2013. This is the most visually oriented culture the world has ever known. There will also be several exhibitions which show the kind of work that gives rise and importance to TRAC2014. Women by Women will be at the Kwan Fong Gallery, Resonating Images III will be at the William Rolland Gallery and the TRAC2014 Invitational Exhibition will be at the Crown Plaza Hotel where the convention will be held, to name a few. TRAC co-founder and professor Michael Lynn Adams will be presenting his still life paintings at the Museum of Ventura County as well. The best option you have for finding out what is going on here is to head out to Ventura and discover it firsthand. TRAC2014 is truly a once in a lifetime opportunity to see such talent gathered together in one place! Nobody wants to be the one who waits for the new renaissance in painting and then misses it when it happens.